I always look for artistic beauty in everyday objects, and I have shown you many that really caught my eye. But this piece has got to be the high point of this concept. Actually, this Wedgwood piece almost takes the “looking for beauty in everyday objects” idea beyond ridiculous! I don’t know about you, but even a crusty old art historian like I am, whose seen a lot of unusual works of art, can have a weekly “What the ----?” moment, and this piece is mine for this week. I mean really, a watercolor paint box made out of Wedgwood’s Jasperware? Jasperware was just about a half-step down from porcelain; in fact many art historians consider it an English variation on porcelain. Okay, I’ll admit it: I don’t see how anyone could use this fancy box for actual painting. Jasperware is unglazed stoneware; wouldn’t the paints stain the little cups? Josiah Wedgwood (1730-1795) was born in Staffordshire, long a center of ceramic production in England. Ceramics in England up to the 18th century lacked the stylistic and technical sophistication of other European ceramics, such as in Spain, Italy, and France. Wedgwood was the son of a potter and was apprenticed to his potter brother at the age of fourteen. He became skilled in all aspects of the trade, recognizing the need for more sophisticated wares in England. His career coincided with the period during which numerous porcelain factories developed in reaction to imported wares from China and Japan. Up until this time, high society primarily used silver or pewter tableware. Relying on the traditional Staffordshire stoneware as a base, Wedgwood’s first success was his “Queen’s Ware,” a cream-colored stoneware fired to the temperature for earthenware. The lead-glazed creamware was so popular that Queen Charlotte of England and Empress Elizabeth of Russia commissioned huge amounts of dinner service. Having royal patronage helped his business, and Wedgwood was the first ceramic artist to produce a catalog illustrating his wares. Between 1773 and 1775 Wedgwood perfected a combination of ingredients to produce his most famous ware: Jasperware. Jasperware was so named because it resembled the semi-precious stone jasper in texture and color. It was hard, unglazed stoneware achieved by adding carbonate and sulfate of barium to a semi-porcelain clay and then using a metal oxide for the desired color. Blue, like that of this paint box, is by far the most famous color. Most Jasperware objects were for display: vases, medallions, plaques, pitchers, and urns. Tea sets, paint boxes, and plates in Jasperware were most likely also for display. Jasperware appeared at a time when the Neoclassical style was all the rage in Europe. This beautiful little paint box has numerous classical motifs such as rosettes, putti, and garland. As a painter, I would be really hesitant to actually use this beautiful piece to paint. I have a beautiful Jasperware plate, a present from my brother, which, of course, is on display. 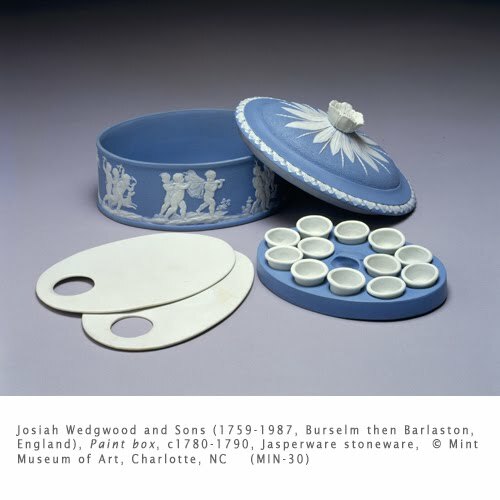 The Wedgwood website displays stunning examples of Jasperware. That is going to be a big help for everyone. That is so cute. Painting is hard. Especially dealing with messy paint. Your cool stuff is a big help.